Combine the garlic through brown sugar in a large ziplock bag. Zip it shut and mix everything together. If it looks a little dry or a little scant, add a tablespoon of water to the mix. Season the beef with salt and pepper and put into the ziplock. Mix everything around so that the beef is coated, and refrigerate for at least 4 hours, up to overnight. Remove the beef from the refrigerator and let it sit out to remove the chill. Heat a large saute pan over medium-high heat. Add a drizzle of vegetable oil and when the oil is hot, add the half the beef. If you add it all at once, it cools the pan too much, and you don’t get that crispy exterior on the beef. 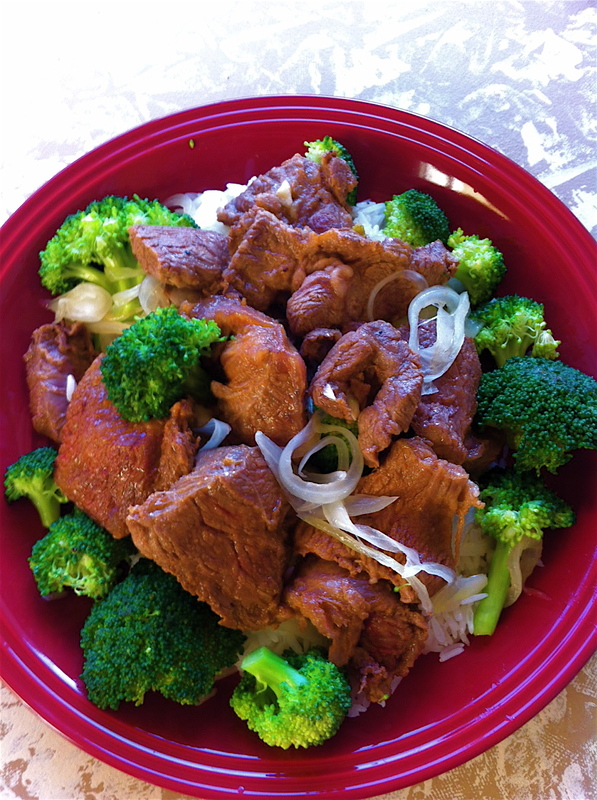 Depending on how thinly sliced the beef is, cook for roughly 5 minutes, stirring repeatedly to cook on all sides. You’ll be reheating the beef before serving, so only cook it about 75% of the way through. Remove the beef from the pan and into a separate bowl. Pour any extra juices into a separate bowl, and repeat the process with the oil and cooking the beef. Again, put the beef a container separate from the sauce. After you’ve cooked the beef, reduce the heat to medium and add the onions to the pan. Cook on medium-high heat until they start to become tender, about 3 minutes. Remove from the pan and add it to the beef. Add the broccoli with 2 tbs of water, cover, and cook for about 4 minutes. Remove the cover from the pan and add the beef stock, beef, onions, and sauce back to the pan. Cook for another 3 minutes, tossing so that everything is coated with sauce. Serve over the white rice.